DC’s premier Wednesday night happy hour event. 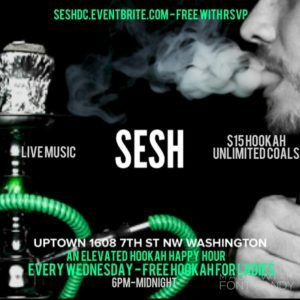 Join us every Wednesday, starting March 8th, from 6 until midnight for cool vibes, live music, infused hookah and an elevated atmosphere. *Free hookah while supplies last. 1 drink minimum for all recipients of the free hookah promotion. Free hookah does not include unlimited coal or infusions. No athletic wear. Dress code strictly enforced.